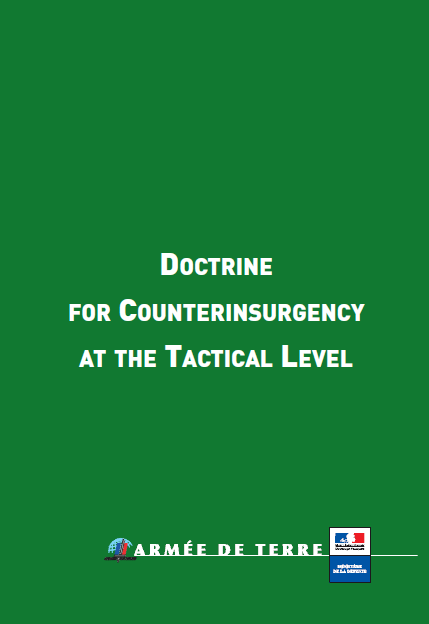 This document covers a particular course of action that is a subset of tactical operations and is conducted primarily during the stabilization phase in order to restore security: counterinsurgency (COIN). It has been developed in order to compensate for the lack of appropriate tactical procedures adapted from classical coercive methods (offensive or defensive) and the control of secured areas. It consists of a course of action intended to face an asymmetric threat imbedded in an armed organization that indiscriminately employs guerilla tactics or terrorism. This course of action uses procedures previously widespread but then abandoned after the war in Algeria, but which are making a comeback due to their relevance in Iraq and Afghanistan. COIN not only covers the tactical aspects of the fight against armed anti-organizational forces but obligatorily becomes part of a global maneuver where the population is at stake. The armed forces therefore intervene to back-up a government strategy that includes COIN by lending support when the situation goes beyond the capability of security forces to maintain order, or in some cases, when these forces do not exist. 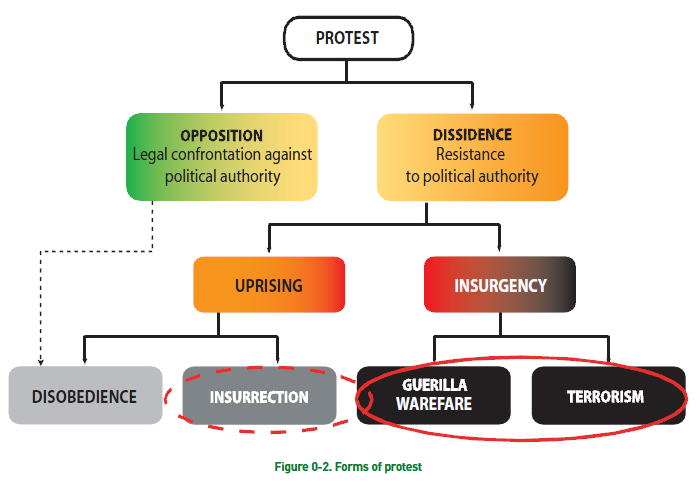 In the context of intra-state conflict, the protest against legitimate political authority can take on several forms – described in the schematic below – two of which, not exclusive of each other, basically arise from the armed struggle: guerilla warfare and terrorism. They are the expression of the same armed resistance phenomenon: insurgency. The protagonists can be classified in three types of systems: the predator system revolving around the search for profit, the demand system focused on seizing local power and the subversive system with a “revolutionary” nature, which seeks to impose its values without any concession. However, the different actors in asymmetrical conflicts frequently belong to hybrid systems, for example, simultaneously acting as both predators and protestors. Whatever the type, insurgency is structured in relation to its environment, and, in particular, in relation to the population which represents the major stake. This point is fundamental.